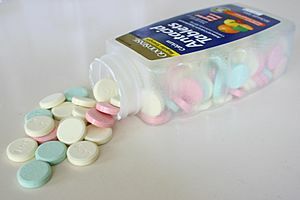 Antacids (or indigestion tablets) are used to help stop indigestion. You may get indigestion if you have eaten too much or if you have eaten too fast. If you have indigestion, the liquid in your stomach will become more acidic. The reaction that is happening is called neutralisation. This is because the tablets are alkaline and the liquids in your stomach are acidic. This reaction between the stomach acids and the antacid will make the acid that causes the problem(s) change into harmless substances such as water or salt. Antacid Facts for Kids. Kiddle Encyclopedia.